William is mentioned in both his father's and mother's wills and was probably the oldest son. He resided at Middleton co Essex. The IGI reads "Birth abt. 1509 of Middleton Essex" son of William and Ann Symonds. Will dated 1 Feb 1564, proved at Canterbury 16 May 1565 by John Wynterflod his executor. No children are mentioned. 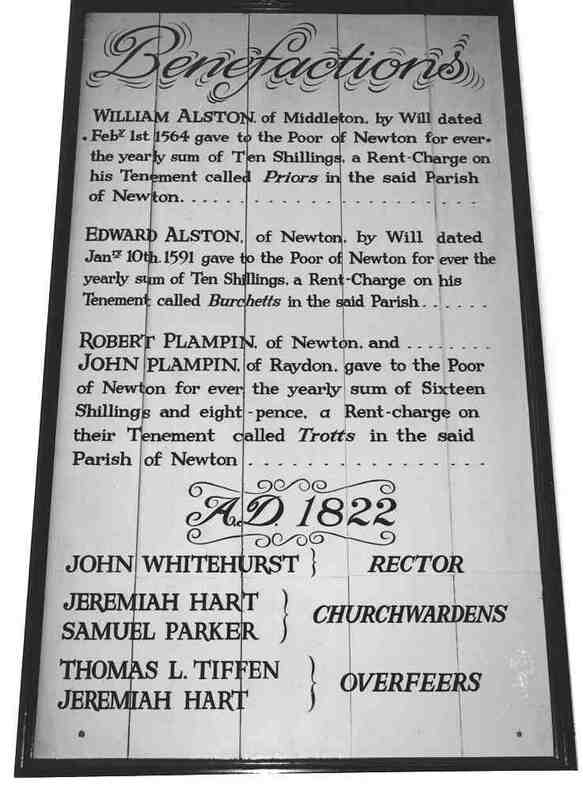 He left a benefaction to the poor of Newton of 10/- paid out of his tenement of Priors Newton, and 16/- for the poor of Sudbury, distributed in bread by the Borough Trustees in 1898, from a tenement in Sudbury near the Rose & Crown, both in perpetuity. He inherited this property from his father. This was still being paid in 1898 (ref All Saints Sudbury) and in Newton in the year 2000. He also mentions a Kinsman of his father one Henry Smyth. THE WILL of WILLIAM ALSTON of MIDDYLTON ESSEX Yeoman. Also 6 milch beasts, six horses, one cart and cart harness for horse, one plough, harness for horse or in lieu thereof L12, 5 seames of wheat or mystelon, 10 seames of barley or mavlte. I give to Symon leafflyn and his heirs my tenement in Sudbury, late buretts and my tenement in Newton called Priors with all the yards, gardens and grounds belonging thereto, which I had as bequest from my late father Will. Alston the sd Symon Laffelyn and his heirs to pay annually to the poor of Sudbury 16/-. and to the poor of Newton 10/-. I give to Edmond Colman the son of John Colman my posted bedstead, fether bed, bolster Coverlett, blankets and sheets, the table and frame for the same, the joyned stools standing in my parlour and L10 in money -The said Edmond to receive the above bequests at the age of 21, should he die before attaining his majority, the L10 to be given to the poor of Sudbury. I give to Alice Kingsburye my sister's daughter L5 and such household stuff, not otherwise bequeathed, as I inherited from my father. Also to my wife Alys such other household stuff as I am proper owner of but no part of the goods of Robart Messynge, late of Sudbury. To my sister Anne Loder L3-6s-8d. To my sister Alice Kingsburye L3-6s.-8d. To the poor of Myddleton L4. To Olive Gates widow 20/-. I appoint Symon Laffelyn supervisor of this my will to whom I give L3 for his trouble. Witnesses : Richard Sendell; Robart Plampeyn, Rich Corker gent., John Hartwell. I give to each of my godchildren 12d. I give to Henry Smyth my father's kinsman 20/-. Proved 16 May 1565 by John Wynterflod executor named in will. ALSTON v. CURD & others. 1608 Chancery B. and A. James I. A. 2. (83). Bill, dated 16 February 1608 by William Allstone of Middleton,, co. Essex, yeoman, v. Grace Curd, Richard Skynner, John Bragge and Robert Warren, clerk. William married Alice  [MRIN: 927].